The scoreboard should be one of your facility’s most important features. It’s where you fans are drawn to during the game’s most dramatic moments. When the home team is down with just seconds remaining on the clock, the crowd’s eyes are fixed on two things - the action and the scoreboard. Play On Courts will work with you to design and install a scoreboard that will leave a lasting impression on your players, coaches and fans. 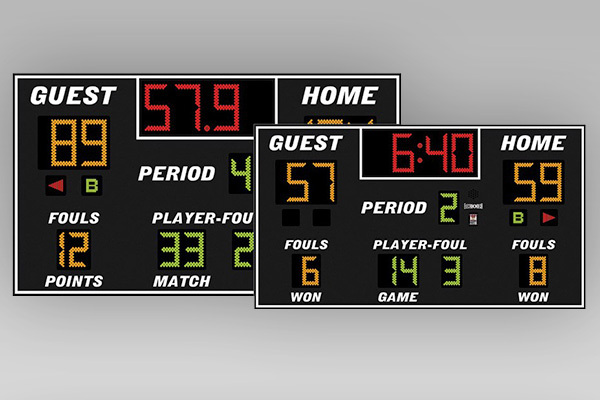 From large venue solutions to small custom applications, Play On Courts will outfit your facility with a scoreboard that will solve all of your scoring needs – and we can design and integrate a scoring solution for nearly every sport imaginable. Customized solutions to best fit your facility. Extensive line of scoring and video display solutions available. Displays automatically adjust to 1/10th of a second. High resolution LED displays offered.